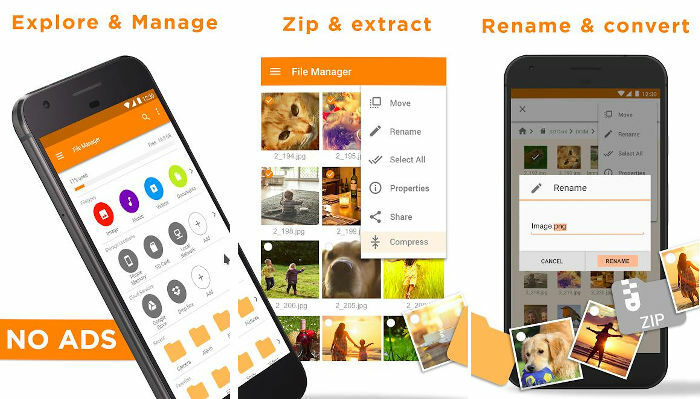 The file manager is a must have app for the users who share or download pictures, videos and APKs frequently. 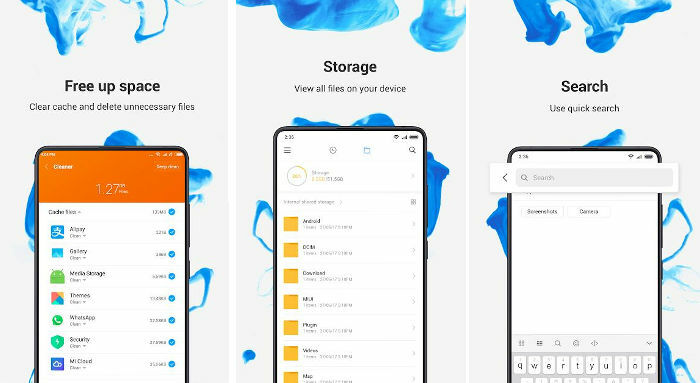 The phone will become a mess if users don’t manage the downloaded files. The default file management tool in the older version of the Android OS is suitable for basic tasks. The stock Android file manager in the latest edition of the Android OS is powerful. 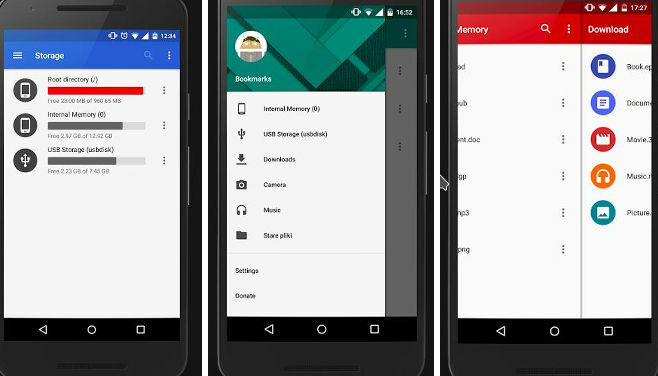 It lets you manage files on the internal store memory, MicroSD card and Google Drive. It lets users find files by name and sort files by name, size, type, and date. The app provides an option to compress folders. It supports batch tasks. Although the application is powerful, it doesn’t support wireless file transfer or other cloud platforms. ESFx is the most downloaded file manager app on the Google Play Store. It was launched in 2012/2013 and has 500+ million users. Unlike the stock Android app, ES enables you to manage files on OneDrive, Amazon S3, Dropbox, Box, etc. ESFx allows you to transfer images, videos, PDFs, documents, archives, etc to a remote PC from the mobile device. It lets users preview files and videos before moving them to another location. ESFx can generate RAR and ZIP archives from folders. It supports Wireless file transfers over Bluetooth and WiFi connection. The app provides a junk cleaner and note editor tool. It has ads and in-app purchases. Although ESFx provides several features, its FTP module is a feature useful only to the developers and users who own a PC. Furthermore, some users may never transfer files over a BT connection or backup mobile phone data to a cloud service. Total Commander is a great alternative to ESF. Instead of bloating the app with several features, the TC app’s developer made a smart move by adding plugin support to Total Commander. TC gives users the freedom of disabling features they don’t want to use. It includes an option to disable icons and manage file permissions. TC doesn’t have in-app purchases and advertisements. 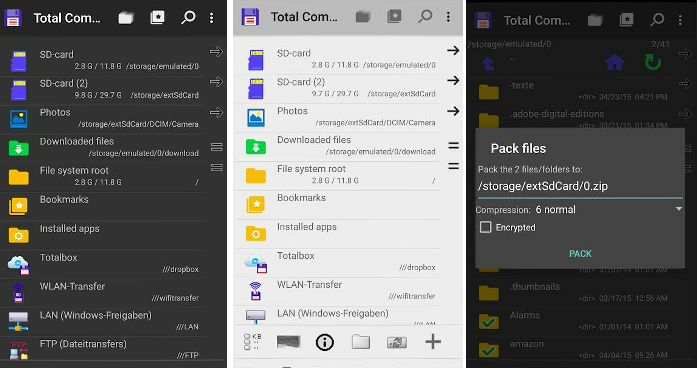 MK Explorer is a material design based lightweight file manager application. It has a built-in music player and gallery utility. It also offers a tool to find files. MK supports two 15+ languages. It supports 9 keyboard shortcuts and customization of the user interface. MKE can compress and decompress files. The app doesn’t support cloud services and wireless file transfer operations. You can configure it to display hidden folders, images, APKs, PDFs, and root directory. MKE can hide application icons from its interface and display image/video thumbnails when you’re exploring a directory. 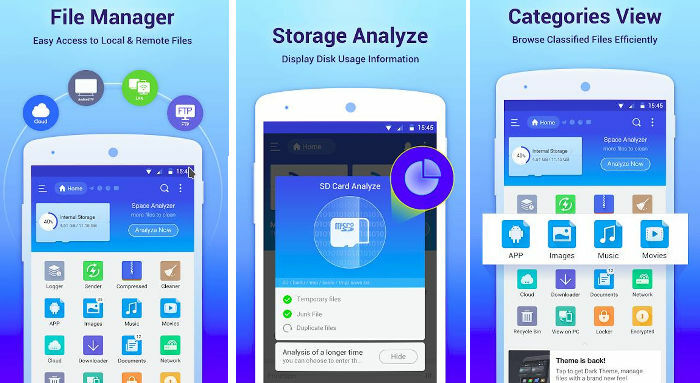 MKE is a must-have app for the users searching for a simple tool to manage files on the MicroSD card or the phone’s internal storage memory. The Astro app has a beautiful interface and many features. It can backup your files to the MicroSD card. It helps you free up storage memory by removing apps that you’re not using. Astro allows users to uploaded or download files over an SFTP/FTP connection. It supports Google Drive, Box, DropBox, and OneDrive cloud storage services. Astro provides a tabbed interface for managing files and folders. The files in it are sorted by their size. The app displays storage memory usage in each tab. Below the storage usage details, Astro displays the list of files. By default, Astro will try to locate files on the ROM, MicroSD and storage memory of connected networks. You can configure this application to ignore specific locations while searching for files. You can sort files by their name and modification date. To improve the performance of its search utility, Astro creates an index of the files saved on the phone. The index is updated in real-time. 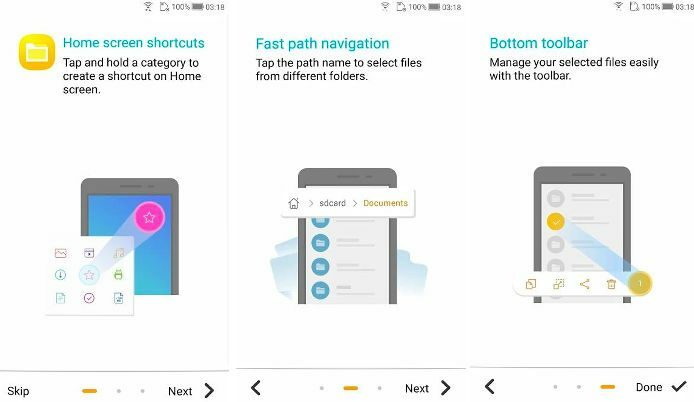 Xiaomi’s file manager application has the best rating among apps we’ve covered here. It has intuitive UI and smooth animations. It allows you to see the files that were created/saved by apps recently. XFM lets users bulk cut, copy and paste files. It has a search tool that displays search results in real-time. The app has a video and music player built in. It also enables you to remove junk files from the phone. XFM supports several languages. It is an ad-free application. The file manager application ships with a recycle bin tool. Hence, you can restore the deleted files in the future. AFM lets users hide files in a password protected vault. It remembers the user’s search history. It also enables users to search by voice. The app’s main interface is customizable. You can add/remove items from the interface. AFM’s most important feature is its storage analyzer tool that makes you aware of large and duplicate videos/images on the phone. The app supports dark mode. Google Files Go is a three in one app. 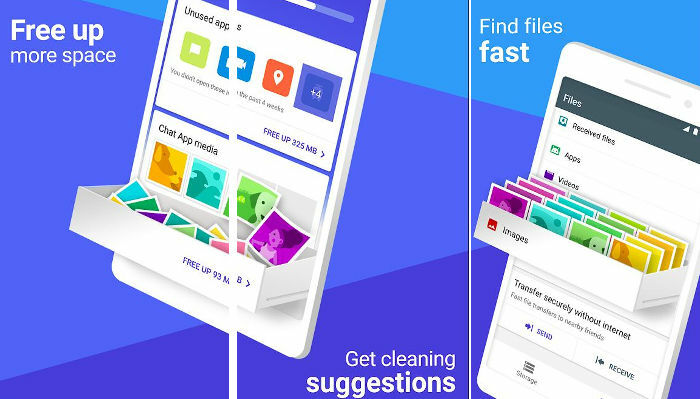 It not only helps users in managing files but also allows them to get rid of junk data and share images, APKs, videos with people nearby them. GFG has a tabbed interface. As in Share IT, you can share files with people nearby you to this application. To use this feature, you must create a virtual hotspot and ask your friend to connect his device to this hotspot. Google Files Go supports batch tasks and it lacks ads. Conclusion: Google Files Go, ESFx, MK Explorer, Astro, Total Commander, Xiaomi/Asus FM are the 7 best Android file manager apps.